I have a white grape vine and the nearly matured fruit is turning black and just drying off on the vine. The vine is about 10 years old and fruited normally last year. I also have a Camelia bush, looks green and healthy but it has not flowered for 2 years. Previous to that it used to drop the buds before opening. I would appreciate your advice . Thank you. The reason for Camellia plants not developing buds or dropping flower buds is commonly irregular water supply. The ground was too dry during the summer months. Camelia shrubs set flower buds during August for the next season. If the ground is too dry the plants are suffering and won't develop the flower buds. Watering and mulching e.g. with bark mulch will help to prevent that. A layer of mulch will help to keep the moisture in the ground. After the buds have set it is important that the plants don't dry out. This can result in dropping off the buds. Keep the soil evenly moist (but not too wet either!). 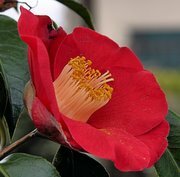 Camellia shrubs like an evenly moist soil throughout the year. Avoid dry or wet soils. The pH of the soil should be around 4 to 6. Add plenty of moss peat or lime-free compost to the soil and keep the ground mulched around the plants. Feeding the Camellias with a fertilizer suitable for lime hating plants will also help to improve the overall health of the plant. Hope you will be able to enjoy plenty of flowers on your camellia next year!